Chapter 2: What is Concierge Medicine? Chapter 3: Why Concierge Medicine? F. David Winter serves HealthTexas Provider Network, a 1000 + physician organization in partnership with Baylor Scott & White Health, as its Chairman of the Board, President and Chief Clinical Officer. He also is in the private practice of internal medicine at the Tom Landry Center on the campus of Baylor University Medical Center. He received his medical degree from the University of Texas Medical Branch in Galveston, completed an internship and residency at Baylor University Medical Center, and has been awarded a Masters of Science in Medical Management from the University of Texas at Dallas. He has been honored with a Mastership in the American College of Physicians and has served that organization as Governor of the Northern District of Texas and Board member of the national PAC. He has been recognized with the Significant Sig Award of Sigma Chi fraternity and is listed in The Most Powerful Dallas 500 Business LeaderS by D CEO Magazine in 2016. Dr. Winter enjoys teaching as an attending physician in the Internal Medicine Department at Baylor University Medical Center, is on the Clinical Faculty of Southwestern Medical School at the University of Texas Health Science Center, and is an Adjunct Professor in the School of Management at the University of Texas at Dallas. He serves on the Board of the Baylor Scott & White Health Care System, the Board of the Heart Hospital at Baylor Plano, Director of the System Professional Oversight Committee of BS&W, Member of the System Corporate Compliance Committee, and Board member of the STEEEP Governance Council. He has served as consultant to the King Faisal Specialty Hospital and Research Centre in Riyadh, Saudi Arabia, the Dallas Sidekicks Professional Soccer Team, the Executive Health Program of the ABC Hospital in Mexico City, the Ministry of Health in El Salvador, the Guatemala Minister of Health in Guatemala, St Francis Medical Group in Indianapolis, St Elizabeth Hospital in Covington, Kentucky, the Lubbock Diagnostic Clinic in Lubbock, Texas, and the Hillcrest Health System in Waco, Texas. He can frequently be viewed on WFAA-TV, the ABC affiliate; heard on radio programs on KVIL-AM, KLUV-FM, and WBAP-AM; and seen on Google video blogs and YouTube under the moniker "Baylor Scott & White Healthy Hangout." He is the President of the Discovery Foundation, a health care philanthropy organization. Dr. Winter is also founder of Baylor Health Care System’s concierge medicine program. He is the founder and past President of MedProvider and also a founding member of HealthTexas Provider Network, a division of Baylor Health Care System. In addition, he was the originator of MedBuilding, a health care real estate investment trust. As a medical writer he has published numerous scientific articles and papers and serves on the Editorial Staff of the Baylor University Medical Center Proceedings. In today’s consumer oriented healthcare system there is no more "one size fits all." In fact, the pressures to customize around the needs and desires of our patients have never been greater. Concierge medicine is the ultimate expression of segmentation and focus. In a world where we must think of an "N of one" versus an "N of many," and must find ways to capitalize on the opportunities afforded by our uniqueness, this model is critical to our success. In a time of constant change, the healthcare industry needs more leaders like Dr. Winter. "Service Extraordinaire" provides a real-life case study of a creative – and effective - care model, concierge medicine, and how it can positively impact physicians and patients alike. As a longtime colleague and patient of Dr. Winter, I have experienced firsthand the passion and dedication he has for medicine and his patients. His successful commitment to innovating patient care is a role model example of what’s working well in health care. Dr. David Winter’s medical practice is one of the most prestigious, successful concierge practices in the country. As a founder and leader of HealthTexas Provider Network, Baylor Scott & White Health’s affiliated medical group, Dr. Winter has demonstrated time and time again that he is a visionary and innovator with respect to the practice of medicine. When Dr. Winter talks doctors should listen. "Service Extraordinaire" will be of great interest to patients and physicians who are dissatisfied with the way they are currently receiving or providing medical care. Dr. David Winter is well qualified to explain how concierge medicine might, or might not, meet the needs of such patients or physicians. His insight is based on being the medical director of 1,300 medical providers, and by his experience as a practicing concierge physician for many years. As defined by Dr. Winter, the main attraction of concierge medicine to both patient and physician is based on a retainer fee that allows immediate physician access to patients in an unrushed manner. There is a strong emphasis on maintenance of good health through proper lifestyle. 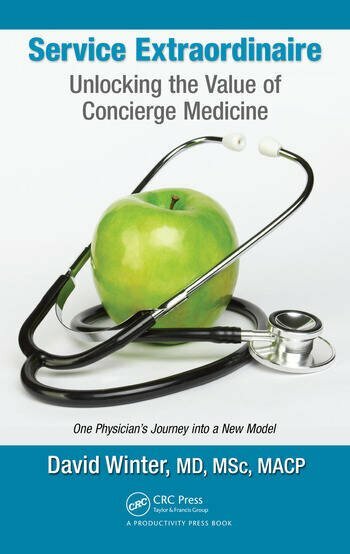 However, this book also makes it clear that another important factor in concierge medicine is that the doctor has sound medical judgment and deep and sustained knowledge of all aspects of internal medicine, so that medical illnesses are promptly diagnosed and appropriately treated, both in an office setting and in high intensity hospital settings. Unfortunately, it is difficult for patients to obtain an accurate measure of a doctor’s sustained clinical knowledge and medical judgment.